Celebrating its 2013 Dakar Rally win, Mini has released an extremely limited edition Countryman for the French market only. As part of its victory celebration for winning the grueling Dakar Rally, Mini has revealed a special edition called the (deep breath) John Cooper Works Countryman All4 Dakar Winner 2013. The commemorative Mini is limited to just 11 examples that honor winning driver Stephane Peterhansel's whopping 11 Dakar victories. It is based on the regular JCW Countryman All4, but it comes with a number of highly distinctive cosmetic touches inside and out to set it apart. Riding on a set of bespoke 19-inch light alloys in a Cross-Spoke Crusher design, it has a matte black exterior with bright green stripes featuring the Dakar winner’s logo, the winning car's number 302 and Peterhansel's signature painted on the hood. The interior has been touched up with green contrasting stitching for the gearshift lever and floor mats, along with embroidered winner’s logo on the head restraints. Green stripes also adorn the center console and black leather seats, while a sport steering wheel and an individually-numbered commemorative plaque round out the interior upgrades. 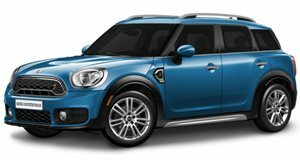 Power comes from the standard model’s 1.6-liter turbo four with 218 horsepower and 207 lb-ft of torque, paired up with Mini's All4 traction system. Whether the look-at-me trim speaks to you or not, however, the Mini JCW Countryman All4 Dakar Winner 2013 will be sold only in Peterhansel’s home country of France.